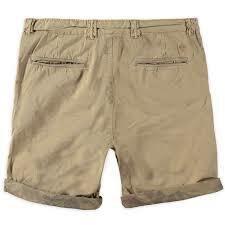 Beautiful Brunotti walking shorts for men. Because of the regular fit, the pants fit every man. The Crewas Men Walkshort is solid-coloured, but has printed hems. The shorts are available in multiple colours, namely sea green, grey, army green, indigo, beige, and black. The walking shorts are shorts that are extremely comfortable and easy to move around in. Ideal if you want to get active in summer. The pants have button closure and two side pockets in the front. They also have two back pockets.